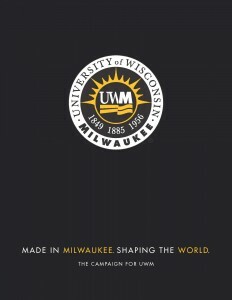 The University of Wisconsin-Milwaukee has an impact of more than $1.5 billion on the Wisconsin economy. When you support UWM, you are investing in our region and stimulating innovation that affects the world. Our fundraising focuses on three main areas: student success, research excellence, and community engagement. THIS IS WHY: Students are what UWM is all about. They are our future leaders and the reason our university exists. Scholarships help us attract the best and brightest students to our campus and allow us to offer opportunities to those with financial need. It is essential that we give students a rich academic experience because we know that education transforms lives. UWM educates more than 26,000 students. 39% of our students are first-generation. More veterans attend UWM than any other school in Wisconsin. The Princeton Review named UWM a 2017 Best Midwestern University based on overall academic excellence and student reviews. THIS IS WHY: Research is about asking questions, and at UWM, we are striving to find answers. UWM ranks among the nation’s top 115 research universities (out of more than 4,600 post-secondary schools). Our faculty and students are discovering ways to improve infrastructure, provide clean energy, advance health and wellness, preserve fresh water, strengthen businesses, protect the most vulnerable, and elevate creativity. The UWM Research Foundation holds 50 patents, with dozens more pending. 13 faculty businesses have ties to the UWM Research Foundation. There are 60 licenses and option agreements on UWM intellectual property. 750 undergraduates research alongside our faculty. THIS IS WHY: Our partnerships — and our 180,000 alumni — keep us connected. UWM is a national leader in community engagement, and we partner with hundreds of organizations, including businesses, schools, health care providers, nonprofits, and performing arts organizations. These relationships keep us plugged into current issues while offering our students real-world experiences before they embark on careers. UWM made the President’s Higher Education Community Service Honor Roll. UWM earned a community engagement classification from the Carnegie Foundation for the Advancement of Teaching. In 2016-17, students, faculty, and staff completed 66,000 hours of community service. Times Higher Education lists UWM among the world’s 600 best universities.